On April 5, Chinese Ambassador Jin Zhijian visited Torg Ehf. and met with CEO.Ms.Ingibjörg Pálmadóttir to discuss about future cooperation. Ambassador Jin spoke highly of the rapid media development in Iceland and pointed out that China fully recognized the prominent role played by the media in promoting the development of China-Iceland relations. 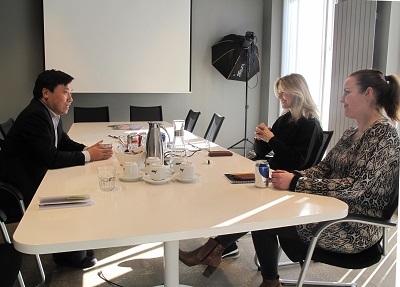 The Chinese Embassy was willing to stay in close contact and strengthen the cooperation with Iceland mainstream media including Torg Ehf Group for promoting mutual understanding between the two peoples and further development of the bilateral relations. Ms. Pálmadóttir welcomed Ambassador Jin to visit Torg Ehf. She introduced Fréttablaðið issued by the group was the newspaper with the largest circulation In Iceland. The group followed closely with the news related to China and the bilateral relations. Torg Ehf. was willing to maintain good communication with the Chinese Embassy. Torg Ehf is one of the leading media groups in Iceland, holding various media platforms of newspaper, website and magazine.